2 Bedroom 2 Bath Cottage right across the beach! Charming beach cottage with commanding ocean view of the best beach on the east side of Hawaii! Waiuli (Richardsons Beach) is the best for swimming, surfing, and snorkeling. What's the best thing about it? It's right across the street! Grab a mask and snorkel (there's plenty of fun beach gear at the house to use!) and go explore the cove! Wish to just relax and lay in the shade? There's a great area behind the house to hang out or bbq while watching the ocean. Perfect for families, groups or a nice couple get-away! Just a hop, skip and a jump to Richardsons Beach Park, a black sand family-friendly beach with lots of fish and sea turtles! 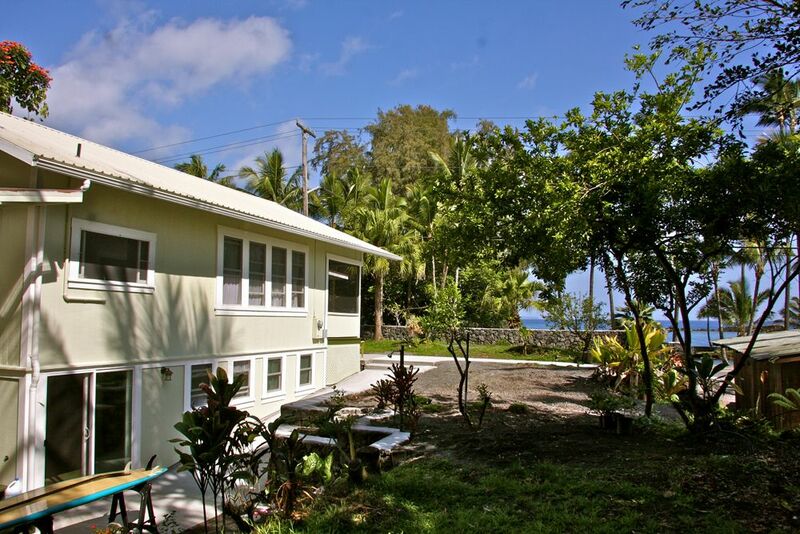 This spacious bungalow is just across the street from black sand beaches and excellent snorkeling and sea turtle viewing spots. We had one spot of bother with our stay--the area is quite popular with the locals and one wandered onto the property--but the owner addressed this rapidly and kindly followed up with us in person. Perhaps just as importantly, the property is only a short drive from Ken's House of Pancakes! Overall, this was an amazing place to stay. This was an exceptional home. Very comfortable and cozy. There were plenty of extras like snorkel gear and anything else you could need. The screen porch is the perfect place to sit and enjoy your morning coffee. Perfect location for exploring Hilo. Beautiful cottage in front of a gorgeous beach. My daughter and I stayed at Waiuli Beach Cottage for three days and loved every minute of our visit. Our only complaint was that we had to leave! It was wonderful to wake up to the sounds of the surf and singing birds, have breakfast on our screened lanai and walk right across the small road to a paradise of shady lagoons, sea turtles and uncrowded, picturesque rocky beaches. The location is convenient for day trips up the coast, down to Pahoa and to Volcano National Park. Although the house has two floors, we only stayed in the upper floor...that was enough space for us. The floor plan is simple and comfortable and we enjoyed shopping at the local markets for fish and vegetables. The kitchen is up to date and we were able to prepare delicious dinners using the freshest ingredients. The hosts are very sweet and welcoming. On previous stays in Hilo, we had stayed at a hotel. We will never stay anywhere else again now! I’m already planning our next trip. Great arrangement for two families! Our son, daughter-in-law and 16 month old toddler stayed in the downstairs area, giving us all plenty of space to accommodate different sleeping schedules as well as being able to hang out together on the lanai and upstairs living area. Richardson Beach is right across the street and has great snorkeling. Carlsmith Beach Park is just down the road--a great place to swim with sea turtles! The owners, Michele and Fuzzy, couldn't have been better hosts! They made sure we had everything we needed and gave us lots of interesting tidbits of information on local flora, fauna and food. A nice location across from the State park with nice snorkeling, swimming and other water activities. The house was very clean and the accommodations were as advertised. Would definitely stay again the next time I visit the Big Island. Perfect for beach lounging and swimming. Lots of fish and marine life to see, including sea turtles right across the street at Richardson's Ocean Beach Park. Recommended activities to see on Hawai'i island: Hawaii Volcanoes Nation Park, Rainbow Falls Waterfall, Hilo Farmers Market on Wednesday and Saturdays, Swimming and surfing at Richardson's Beach! Base rate is for maximum 4 guests. Additional GUEST $25 per night, per person up to 6 guests. Refundable $200 deposit is required to secure your reservation. DEPOSIT TERMS: Deposits are refunded back to method of payment by VRBO systems refund on the 15th and last day of the month. Rates are subject to change until reservation is confirmed.